When a South Florida man went to the emergency room with severe pain on his right side, a quick diagnosis resulted in laparoscopic gallbladder surgery right away. Less than three weeks later, the man was dead. Positioned just below the liver, the gallbladder is responsible for storing and releasing bile, which is the digestive fluid that breaks down fats in the body. In some people, gallstones form from matter that solidifies in the gallbladder, causing severe pain as the gallbladder is blocked and bile cannot be released. Although proper diet and exercise can prevent the development of gallstones, once they have formed, surgical removal is the only way to get rid of them. 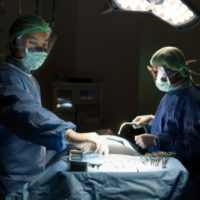 Removing the entire gallbladder surgically is a common response. Abdominal pain, particularly in the upper right, and generally following a meal. Most often, gallbladder removal is a laparoscopic procedure, which is minimally invasive. Essentially, tubes are inserted through an incision in the abdomen. A tiny video camera is sent into the body through one of the tubes, giving the surgeon a clear look at the abdominal cavity. Additional tubes are used as conduits for surgical tools, allowing the surgeon to remove the diseased gallbladder. Slicing through the common bile duct, which will release bile into the small intestine and abdomen. Because bile is very toxic, the patient will become very ill. Repairing the problem may be quite complex, resulting in the patient having to wear external bags to capture draining bile, for a lifetime in some cases. Damage to the iliac vein, causing excessive bleeding. If you or a loved one went into surgery expecting a simple solution, and came out with serious health consequences, it is possible medical malpractice was the root of the problem. At the Law Offices of Robert W. Elton, our experienced team will investigate the situation and work to secure the financial support you deserve. Contact us in Daytona & Ormond Beach for a consultation about your case today.